By now you’ve heard about Winnipeg’s size and skill. It was on full display last night as the Jets outworked Nashville defensively and offensively. All postseason, Winnipeg has effectively used their size in front of the net creating messy traffic and high-scoring chances. Something San Jose did well against Vegas in the second round. Overall, San Jose had plenty of chances in front of the net, but was mostly unsuccessful. Tomas Hertl (6’2″/220) used a mix of size and talent, tallying three goals in six games. Two were almost identical in that Vegas defenders couldn’t clear the puck, or San Jose attackers. Notice the swarm of teal surrounding Fleury. 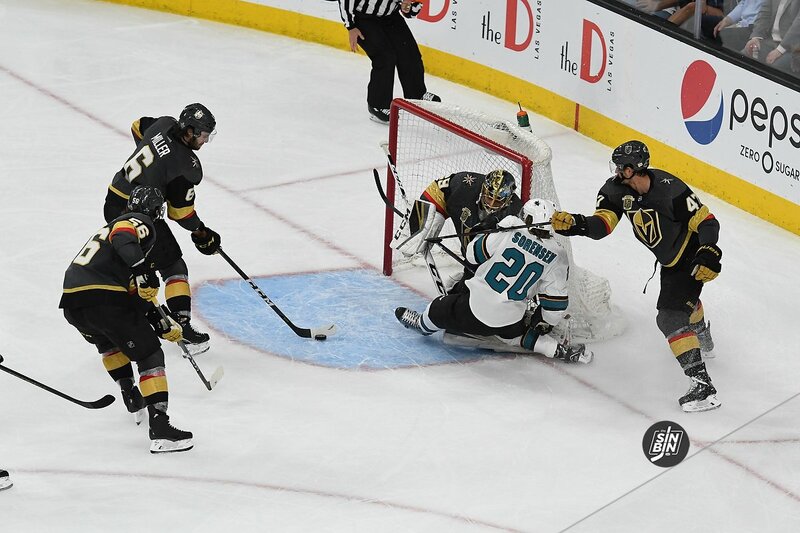 Five Golden Knights allowed four Sharks countless opportunities to convert. Inches away from Fleury. In the end, VGK’s defensive lapses didn’t hurt them from advancing, but it could in the conference final. Winnipeg’s net presence is similar, if not better than San Jose’s attack. Here’s two examples of Winnipeg’s heavy net pressure from their first-round matchup against Minnesota. Three Winnipeg players crash the net giving room for defenseman Tyler Myers to attack. Wild goaltender Devan Dubnyk had little chance with four Jets swarming his crease. In the second example, the Jets immediately stormed the goaltender after a D-zone giveaway by Minnesota. Winnipeg’s top line took advantage setting up a quick, close strike from Mark Scheifele. Captain Blake Wheeler bullied his way to the front of the net allowing clearance for his linemate. 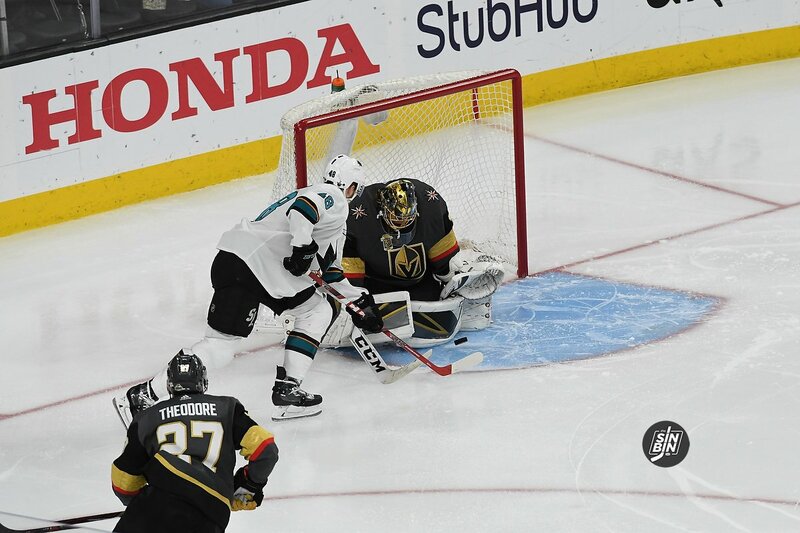 The Golden Knights recognized their defensive mistakes and will consciously play tighter this series around their own net. Winnipeg will pounce on any chance Vegas allows, especially loose pucks in front of Fleury. Covering the size and skill of Patrik Laine (6’5″), Wheeler (6’5″), and Scheifele (6’3″) will be the toughest assignments Vegas will defend all season. How can the Golden Knights defense clean up their zone against Winnipeg’s offensive pressure? While it’s nice to have a Dark Knight type in the crease, Vegas’ defense can’t allow that much pressure on Bruce-Wayne Fleury again. The Jets net presence will be a primary focus for the Golden Knights defense. It could be the difference in the series. After studying game film, the team got frustrated by the defensive breakdowns around the net from last round. However, #27 says don’t fret. Theodore and the defense will be prepared for Winnipeg’s size, skill, speed and tacky whiteouts too. Keep telling yourself that! The Knights are going to look like roadkill by the end of this series. Your defense-men will be confused for advertising on the boards around your net. By the end of the second game just like the Wild you will be calling Jets bully’s. We played the Sharks this spring too.. Ho Hum.. Good Luck! He who puts his armor on should not boast like he who takes it off. Good article, especially because I think a lot of us watching the Sharks series felt that was the biggest issue — the puck sometimes got stuck for long, dangerous stretches right in front of the crease and wasn’t cleared whatsoever. It was downright frustrating to watch. They need to be willing to do whatever it takes to get it out of there, I don’t care if someone has to fall down on top of the puck “accidentally,” but if it’s in the danger area like that it has to be cleared or stopped somehow. I’m not that worried about further away chances from the Jets, but I think one thing I noticed especially on power plays is that playing aggressively rarely gets you burned and it’s in fact quite the opposite. If you sit back and let them continue to make around-the-ice passes, putting no pressure on whoever has the puck, eventually someone gets open for a nice shot. The best defensive tactics I saw were when the Knights were aggressive about poking the puck away, cutting off a pass (created by not just sitting there), or pressuring a turnover. I swear Jason from the podcast is playing the role of promoter in wrestling as everytime a series or game comes up he talks about how great the other team is and says the knights are gonna be in trouble. Its like Im reliving the 80s again in hulk Hogan era wrestling, now the jets are Andre the Giant, but much like Hogan the knights will win. The Jets are extremely aggressive in putting 3-4 bodies in front of the net. But that also makes them extremely vulnerable to the Knights’ slashing counterattack. Should be a great series.